The cause of the fires and the specific motivations of anyone who may have set them have not yet been released. 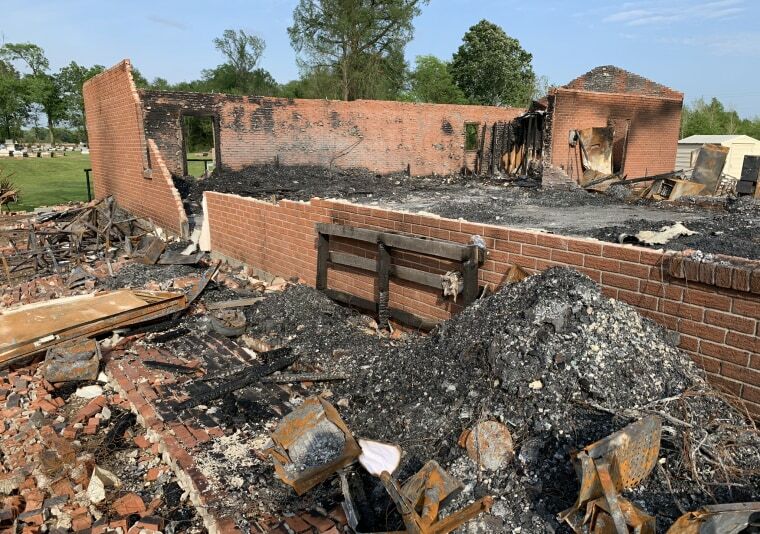 Last week, Sheriff Bobby Guidroz said it in no uncertain terms: whoever is responsible for the spate of church fires in St. Landry Parish, Louisiana, will be identified, arrested and brought to trial. In modern America, there are some places where people view the depths of others’ religious devotion with skepticism and speak about it in sarcastic terms. But there are many others where people are appalled by the absence of religious fervor in some communities and skeptical that a home can function well without it. St. Landry Parish, Louisiana's equivalent of a county, is home to about 83,000 people who, for the most part, fall into the second category. That fervor has extra meaning now, after three predominantly black churches were set ablaze, and in some cases destroyed, in the span of less than two weeks. The cause of the fires and the specific motivations of anyone who may have set them have not yet been released. But the magnitude of the loss and the reasons black churches may have been a target are much more clear. Black churches have always represented spaces within a racially unequal society that were black-owned, black-operated and black-controlled, said Anthony Pinn, a theologian and professor of humanities at Rice University, who studies religion and culture. Because of that, the spaces black churches create can be used to meet community needs, with or without the sanction of others. The church staff members are paid by black people and therefore attuned to their interests and experiences. That means black church pastors are often in the rare social and economic position to speak publicly about controversial matters and turn black churches into gathering spaces and rallying points for those engaged in various forms of protest and social change. “Whether what is going on inside them is truly revolutionary or that is only imagined or assumed,” said Pinn, who wrote the books, “Why Lord” and “The Black Church in the Post Civil Rights Era." Mount Pleasant, a church with about 150 official members and 60 to 70 people in its pews most Sundays, once served as a school for black children. Today, its doors open mostly for choir rehearsals and church services. But it remains a gathering place in a rural community, a valued space in a sparsely populated but expansive parish. There are many theories about the culprits and their motives, Hines said. After the second fire at Greater Union Baptist Church, Hines was sure that someone was targeting black churches. It was just too big a coincidence after St. Mary Baptist Church, another black church in the same parish, burned the previous week. Hines was so sure someone was after the parish’s black churches that he wondered if Mount Pleasant should install security cameras. The thought occurred to him Tuesday. By Thursday morning, he was standing near Mount Pleasant watching firefighters work to douse the blaze. While there’s nothing going on in St. Landry that, to Hines, immediately explains what seems like a targeted campaign to destroy black churches, there are broader trends that do, he said. Guidroz has put his 55-person patrol team on mandatory overtime. That’s necessary to cover the parish’s 960 square miles of roadway. The department is trying to monitor the area’s many churches while local, state and federal investigators investigate, Guidroz said. For Pinn, the burned churches brought to mind the nation’s history of destructive force and attempted control directed at black churches. After the Civil War, federal troops occupied portions of the South enforcing mandates that granted black Americans full citizenship and black men the right to vote. Black Americans bought and sold property, married, scrambled for basic literacy skills and formal education, all forbidden by law in most states during slavery. Churches that had in some cases formed in secret became public and physical institutions. The nation’s new multiracial electorate — a group that in some Southern states was majority black — installed black state and federal lawmakers who, before the Civil War, were widely regarded as imbeciles and animals. White residents fumed, lamented the redistribution of power and the development of something that approached equity as a loss of power. Klu Klux Klan membership surged. When political events allowed, a Republican president and Democrats in Congress effectively ended the policies that had made possible the post-war period of multiracial inclusion known as Reconstruction. A wave of black church burnings and lynchings followed. But the three still-unexplained fires in Louisiana have erupted when the share of Americans who say they are not people of faith, are atheists or agnostics, is growing. In 2019, 21 percent of black Americans and 23 percent of both white and Latino Americans fall into that category, according to a 2019 Gallup Poll study. And for the first time in 2018, just half of all Americans described religion as “very important” in their life. There are, however, some racial and regional differences in the slipping influence of religion and religious institutions. In 2019, about 40 percent of black Americans told pollsters they attend church most weeks compared to about 32 percent of white and Latino Americans, Jeffrey Jones, senior editor of the Gallup Poll, said. People of all races in the South were also far more likely to say the same than those in the North, East and West. However, much of the regional variation can be explained by the size of black populations in Southern states, Jones said. Within those numbers are a range of stories. Many African Americans are true believers, Pinn said. Some are in church for spiritual needs, others are there for cultural and family reasons, for the social connections and camaraderie, to meet expectations about propriety and duty. Last Sunday, Mount Pleasant’s members worshiped at another area black church where their pastor divides his time. It’s a place where some of Mount Pleasant’s members have visited or attended events in the past. But, as soon as fire investigators grant permission for Mount Pleasant members to re-enter the parking lot of their burned church, Hines suspects services will be held next to its remains. What isn’t in debate for people such as Hines in St. Landry Parish is the magnitude of what has been lost. Mount Pleasant is the place where Hines’ wife grew up attending church. It’s where the couple have attended services most of their married life, celebrated their greatest joys and sought comfort for their deepest sorrows. It’s also a place where Hines, a bricklayer by trade, and other members did much of the physical work over the years to update the church’s interior and exterior, making it a blend of the old and new. Now, among the items church members fear may have been lost in the fire are a pulpit and railings crafted in the 1870s.